"If one does not come in the disciplic succession, he'll spoil the teaching. That is being done. So-called commentator, teacher of Bhagavad-gītā, he does not come in the disciplic succession. He is self-made guru. Therefore he's not guru. Self-made guru cannot be guru. He must be authorized by the bona fide guru. Then he's guru. This is the fact. Here... Nobody can be self-made anything. A medical practitioner, he cannot become self-made, that 'I have studied all the medical books in my home.' No. 'Have you ever gone to the medical college and taken instruction from the bona fide teachers?' Then, if you have got the certificate, then you are medical practitioner. Similarly, bona fide guru means he must be authorized by the superior guru. Just like Caitanya Mahāprabhu says, āmāra ājñāya guru hañā tāra' ei deśa (CC Madhya 7.128). He must receive the order from the superior. And the superior must be bona fide. Then he's bona fide, not self-made. Tasmād guruṁ prapadyeta jijñāsuḥ śreya uttamam (SB 11.3.21). The direction is that one must go to a guru. But who is guru? Śābde ca pare ca niṣṇātaṁ brahmaṇy upaśamāśrayam. These are the descriptions. So to find out a bona fide guru is not difficult, provided one is bona fide to search out a guru. Therefore Caitanya Mahāprabhu said, guru-kṛṣṇa-kṛpāya pāya bhakti-latā-bīja (CC Madhya 19.151). By the mercy of guru and Kṛṣṇa... Because by the mercy of Kṛṣṇa one gets a bona fide guru, and by the mercy of bona fide guru, one gets Kṛṣṇa. This is the process. When I am actually serious to have connection with Kṛṣṇa, Kṛṣṇa is sitting in everyone's heart. Īśvaraḥ sarva-bhūtānāṁ hṛd-deśe 'rjuna tiṣṭhati (BG 18.61). So Kṛṣṇa can understand. We cannot hide anything from Kṛṣṇa. That is not possible. Because Kṛṣṇa is sitting side by side, just like two birds, sitting side by side. One bird is eating the fruit of the tree. Another bird is the witness. That is the Vedic version. So as soon as I become serious to know about Kṛṣṇa, Kṛṣṇa can understand, 'Now My friend is very serious.' So He will find out a bona fide guru for him. 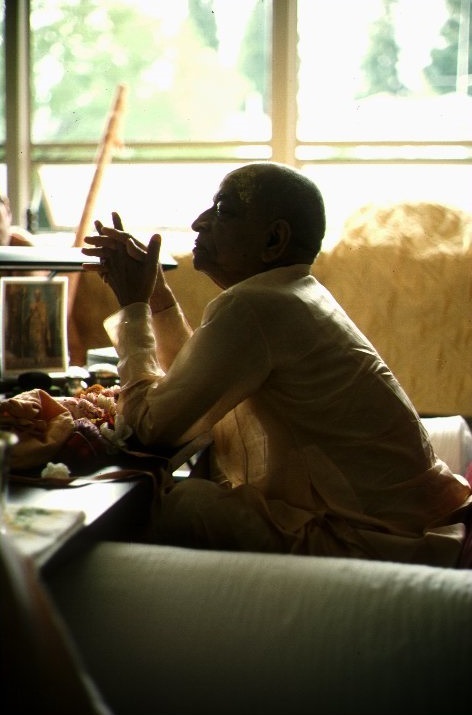 Therefore Caitanya Mahāprabhu says that guru-kṛṣṇa-kṛpāya pāya bhakti-latā-bīja. By the, by the double mercy... Kṛṣṇa's mercy, and guru's mercy. If one is serious, Kṛṣṇa is satisfied: 'Now he's serious about finding out, about knowing Me.' Then Kṛṣṇa gives him direction that 'Here is guru, My representative. You take shelter of him and you will get Me.' This is the way."